Remembering my first carving brings back mixed emotions. In 1969, I was in the U.S. Army at a small fire-support base across the pond in Vietnam. I had a 3-inch, 3-blade pocketknife made by Kabar. I started carving whimsical pieces from broken 105mm Howitzer ammunition boxes. I still have the knife. I don't carry it anymore, but it is a great reminder of what can be done with a simple knife and a stick. After I served in Vietnam I opened my taxidermy studio. A customer brought in a cinnamon teal duck to have mounted. A couple of months later he came back in with a beautifully carved and painted cinnamon teal decoy. He suggested that I try carving one because he thought I'd good at it. I carved a drake bufflehead and sent it to a competition in Omaha, Nebraska where I won a blue ribbon. I'm inspired by all of it. I have many ideas at any given time, but I will decide to execute an idea only if I have a clear vision and concept of it. I become completely involved with the process of gathering references and going over in my mind different ways I can execute them. There are seemingly endless decisions and questions throughout the process. 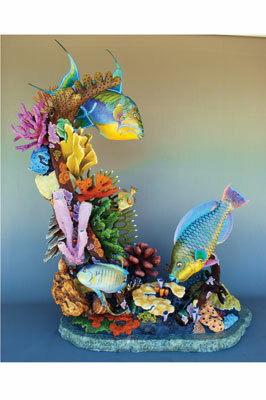 I'm currently working on a backlog of fish carvings for the holiday season. It never fails that people call asking for a custom carving that I have 'in stock.' No such thing. 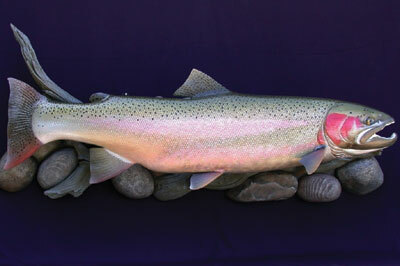 So I've learned to carve and paint various sized rainbow and brown trout from 12-18 inches in size. Which tool wouldn't you be without, and why? All of them. I use so many tools on any given piece that I wouldn't want to do without any. However, the one 'tool' that I appreciate more and more, that is truly priceless, is my eyesight. Good eyesight is everything when it comes to doing realistic interpretations of nature's shapes, textures, and colours. Which is your preferred style of carving, and why? My carving style has always been realistic. I approach any form of creative art with the goal of the most accurate, realistic interpretation of it that I can. Whether it is a sculpture, a carving, a painting or whatever, realism has always been my objective. 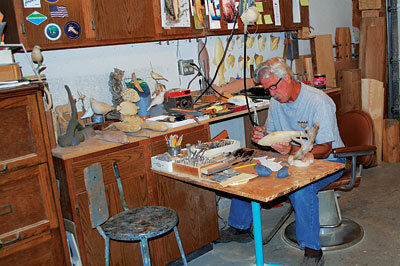 My biggest carving achievement is the fact that today fish carving is a recognized, stand-alone art form. I took my first fish carving to a taxidermy competition, and because fish carving didn't exist, it competed in the Reproductions category. Fortunately, it won. Within a few years, there was enough interest and the World Fish Carving Championships were established. Who's work do you admire most? I know, or knew John Sheeler, Larry Barth, Jerry Balcier and Kent Ulberg, all of who are contemporary sculptors who have made a huge impact on what I do. I admire their attention to detail and their ability to understate when needed to conform to art standards. If you weren't a carver, what would you do? My workbench, or studio, is the 3-car garage of our home. It's perfect because in California there's no need to protect your car from the weather. I do. My radio is always on and I have a collection of CDs I listen to. Music from the 60s up. Which reminds me, I have to buy some new ones. I can honestly say that I carve for who I would most like to carve for now. A large part of my business comes from the conservationist attitudes of today. When a fisherman catches a trophy-sized trout he photographs and measures it, then releases the live fish back into the water. 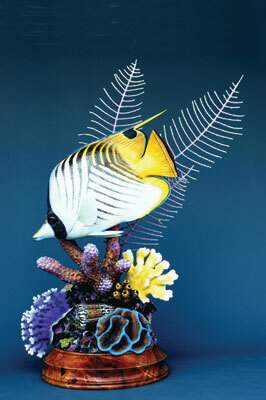 They send me the information and I create an exact replica of the fish. It's great because everyone wins, including the fish. Absolutely. When I'm working on a piece, I'll take it inside after my day is done and place it where I can view it, which is usually the fireplace mantle. In the evenings I can see things I want to change that I wasn't able to see in the shop. In years past, my goal was just to carve a duck or a fish. Now, I carve to expose the beauty of my subjects for viewers today and in years to come. To find out more about Bob Berry and see his other carvings please visit his website.